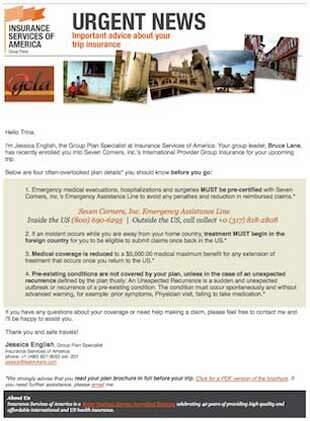 If you’ve recently purchased group travel medical insurance under our group insurance plans, we would love to send each of your group members and your group leader a helpful “Know Before You Go” email prior to their trip. Participation in receiving the “Know Before You Go” email is completely voluntary. Nevertheless, we strongly urge you to equip your team with this helpful information, so they get the most out of their insurance. To participate, please fill out the form below with your team and trip information as well as email addresses for each of your members. We do not sell, spam or share your email addresses. Whenever possible, we will send your team leader and team members the "Know Before You Go" email prior to their departure date. Please allow one week's notice for us to create and send the email. If we receive your request after the departure date, we will send the email at our earliest convenience. The team leader's name will be included within the body of the "Know Before You Go" email. It is important to let your team members know that you've shared their email addresses with Insurance Services of America so that we can send them the "Know Before You Go" email prior to their trip. For anyone not on the team, but who would also like to receive the "Know Before You Go" email, please enter their information here. Click the "+" to enter more names.